It was not only our first tasting of a Port Ellen (our 100th bottle.. in spirit) but Liz was leaving us (for a while). So Port Ellen matched with a peated Cooley as an Irish goodbye - a dream duo? "Salted almonds". As far as openings go, in an olfactory game of chess, that truly was a Grob's Attack. So much so, that it was immediately declared to be "wrong". But foolhardy he or she who dismisses the Swiss International Master Henri Grob. "What about the Romford Counter Gambit?" I hear you ask. One wonders how anything was nasally detectable this evening, due to the overwhelmingly pungent aroma of anticipation hanging in the air. The wares of the Port Ellen distillery, silent for 31 years, were untried by roughly 85% of those present. On the nose then came sweet fruity notes: melon, fruit gums and cherryade. Furthermore an overwhelming sense of freshness- grassiness and menthol, cutting through the thick fug of expectation. So fresh in fact, it was fresh in an Australian accent, like ... I dunno, something really fresh like ... the outback. Yeah that. Port Ellen... finally... and maybe never again? The scents became increasingly vague. It was mothball-y-ish; it was like wood varnish, but just a wee bit; it was how I imagine ants smell (‘how I imagine the smell of ants to be, rather than the action of their smelling’); and finally the most generic of adjectives- it was "nice". "Nice to smell you ... to smell you nice", to be exact. We like smelling it. 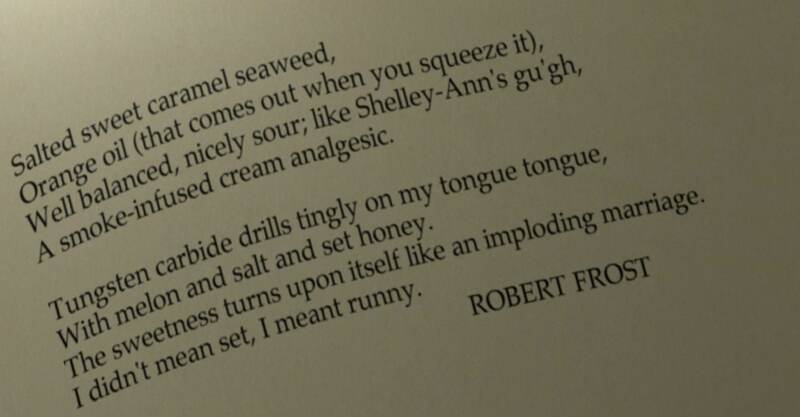 That poem, entitled "Wordsworth On Acid", taken from a collection of B-sides and rarities, provided a startlingly accurate account of the flavour combinations. Except the analgesic bit, we're not sure what he was talking about there. The finish was, as so many are, bittersweet. Like a dried mint marshmallow toasted over a candle, or over a paraffin lampy. Lengthwise, all agreed that it was a simmering pot, and that it was most definitely simmering on the back hob.